International treasure and the most glamorous being who has ever lived, Joan Collins, is already considered the true Queen of England and anyone who tells you otherwise is a first-degree lie-telling piece of uneducated trash and they’re probably committing a major slanderous crime, so call the bobbies on their stupid asses. THE QUEEN damn well knows that Joan Collins is the real diamond-encrusted heart of Britain (sorry Katie Price and Jodie Marsh) and she should give the crown to Joan, but she’s not going to do that because then she’d have to get a job. But THE QUEEN did do a right by making Joan a dame for her contributions to glamour, artistry and beauty. “Not in a billion years did I think I would be made a dame,” said the 81-year-old after Thursday’s investiture ceremony at Buckingham Palace, London. She was honoured for her charity work, including with the NSPCC and breast cancer research. She is also a patron of children’s hospice charity Shooting Star Chase, which nominated her for the honour. Accompanied by her fifth husband, Percy Gibson, and her daughter, Tara Newley, Dame Joan said she was still working and had “a lot of irons in the fire”. 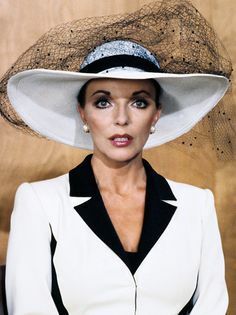 And well now you know that if you ever meet Joan Collins in person you have to add “Dame” to her title of “Eternal Glamour Goddess of the Universe” when addressing her.